BreakMentalDown: It Might Sound Corny, but Save Money by Popping Your Own Popcorn -- Take that Orville! It Might Sound Corny, but Save Money by Popping Your Own Popcorn -- Take that Orville! Pay no attention to that man putting the small yellow pellets into the bag. Especially do not take notice of him as he folds up the bag, sets it in the microwave and walks away. Ignore the sudden popping noise, this is all perfectly normal. You've assembled a recipe for awesome. To the average person the preceding scenario might seem a tad alarming. After all, they've had to have seen Steven Seagal fashion a bomb in this fashion, and they might suddenly fear a bad actor will soon ambush them. But the reality is, I'm just making popcorn. 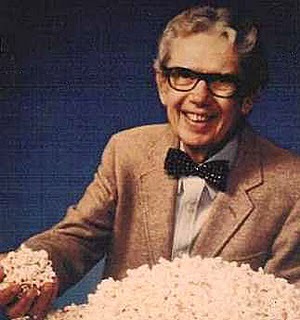 You don't need to indulge Mr. Redenbacher and buy his microwave-ready corn. There's no need to purchase one of those ridiculously overpriced popcorn poppers. All that's needed to make grade A-quality corn is a brown paper bag, popcorn kernels and a determination to not eat copious amounts of chemicals and preservatives. Believe me, that last requirement presents quite the obstacle to overcome. That “butter” got me through so many rough times. Once you've assembled these items and the wherewithal to go through with it, here's the simple process to make homemade microwave popcorn in a brown paper bag. Place popcorn in the brown paper bag. I generally like to cover the bottom of the bag with kernels. Fold brown paper bag over three times. Once is far too flimsy and will shoot steam out. Four times doesn't allow the popcorn to expand. Put bag in microwave for two minutes. Most popcorn bags say you're supposed to base it upon the popping time of the kernels. But in this brave new world of brown bag popping, we know all microwaves ever have only taken two minutes to make popcorn. Realize there's not that many steps to this whole process and your submission would be laughed out of eHow for being too simplistic. But those eHow douches won't get the last laugh in this case. Oh no, if you make an entire step talking about how much you dislike eHow, suddenly everyone will follow that step and then they will dislike eHow. Then when eHow repents and says they need you more than you need them, you realize you're in a position of power and can make eHow give you a purple unicorn, and then make them walk said unicorn and bathe it twice a day. Realize that last step took a surprisingly vicious turn. Breathe. with my specially designed popcorn shiv. Now it's time to top it! Feel free to dash on a tablespoon or two of olive oil or butter. Add in some salt, and then toss on something fun like chipotle chili powder, Junior Mints, sriracha, nachos, Rocky Mountain Oysters, or the undying soul of a virgin child. The great part is, without all the chemicals from the normal bags of popcorn, it's virtually a guilt free endeavor. That is, if you're okay with having virgin blood tainting your popcorning experience (but in this day and age, who isn't). What's great about this six-step process is not only does it take down one of the most stuck up of all how-to websites, but it's a lot cheaper than what Orville himself charges. A standard box of popcorn has six packs and runs roughly $2. A two pound bag of popcorn also runs about $2, but can be used to make roughly 12.96 servings of popcorn. So, sit back, grab your 6.96 extra servings and just wait for this FAQ to show up on eHow. Thursday is Dead! Long Live Splortchelsday!